Fifty-two years ago, on January 15, 1956, on a Sunday, Shimabuku Tatsuo called a meeting in his home dojo in Chan, village. Kaneshi Eiko and Shimabuku Shinsho were both at that meeting. According to Shinsho (Ciso), there were about twenty persons at the meeting. Most were Okinawans but a few Americans were in attendance. 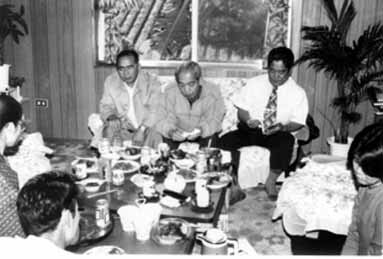 On December 24, 1984, I had the opportunity to meet with Kaneshi Eiko, Shigema Genyu and Kaneshiro Kenji at the home of my brother-in-law, Ikemiya Hiroshi. Hiroshi was a friend of Kaneshiro Kenji and Kaneshiro was a past student of Shimabuku Tatsuo Sensei. In this interview, Kaneshi Eiko and two other Okinawans who studied with Shimabuku Tatsuo Sensei answer questions about the prior years to naming Isshin-ryu, on January 15, 1956. Kaneshi Eiko, was Shimabuku Tatsuo’s right hand man until he broke away because Kichiro, Tatsuo’s First son. Kaneshi and others, give their reasons in this interview. 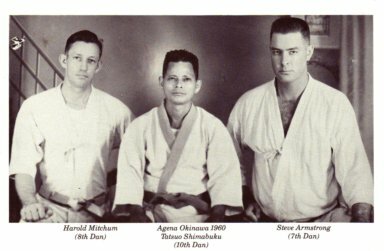 Most important, is we are getting this interview by some of Shimabuku’s top Okinawan students who first taught the first Americans at Chan Dojo, in 1955-56. Interview with Eiko Kaneshi, Genyu Shigema and Kenji Kaneshiro. At the home of Hiroshi Ikemiya, Taba, Gushikawa Shi, Okinawa. This interview is recorded on audio cassette. Present were Arcenio and Michie Advincula, Cyrus G. Bess and his wife Etsuko Bess, Ikemiya Hiroshi and his wife Ikemiya Yasue . October 13,1914. He began his training from Shimabuku Tatsuo Sensei in 1947 at the Tairagawa dojo. At one time he owned a cement block Company but no longer has it. Kaneshi is a Shinto priest of the Seicho No Ie ( House of growth) and a successful business man. He demonstrates and explains the ritual Tatsuo did at all the big karate demonstrations. 1. O Inori (prayer) for good luck. Bow once. 2. Clap hands twice (kashiwade), alerting heaven and earth (rub hands in a small circular motion). 3. One leg steps to the rear into seisan dachi chopping to the front as in the opening of kusanku kata. Genyu Shigema was born on December 3, 1929. He started with Shimabuku Tatsuo in 1953. Shigema worked for the Marine Corps Food service at the Futenma Air Station SNCO Club. At the time, he had been working there for the past 15 years. He worked for the Camp Courtney SNCO Club 35 years ago. Because he could speak English, Shimabuku would have him teach the Americans. He states that Orego and Cooper were the first Americans, or a least who he remembers. Kaneshiro Kenji was born on April 10, 1931. 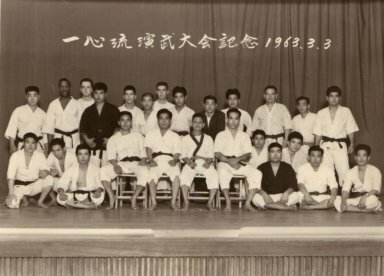 Kaneshiro began training from Shimabuku around 1954. He is a lawyer and at one time a English translator. He used to work in the Gushikawa prosecutors office. He is a good friend of Ikemiya Hiroshi who at one time was a Gushikawa, City councilman. It was Hiroshi who got in contact with Kaneshiro to set up this meeting at my request. Kaneshiro is a lawyer and was also at one time an interpreter so he did most of the talking. Kaneshi, Shigema and Kaneshiro drove up to meet me at Ikemiya’s house at 2 PM. After introductions, refreshments such as tea, beer and food were served by Ikemiya Yasue . The interview lasted from 2 PM until 7:20 PM and tape recorded on a audio cassette. Kaneshi speaks mostly in Japanese or Okinawa Hogan (dialect) while Shigema and Kaneshiro use English, Japanese and Okinawan Hogan. the thumb on top. He is also wearing for the first time, a karate GI top. I show them a photo taken in the Tairagawa dojo in 1949. 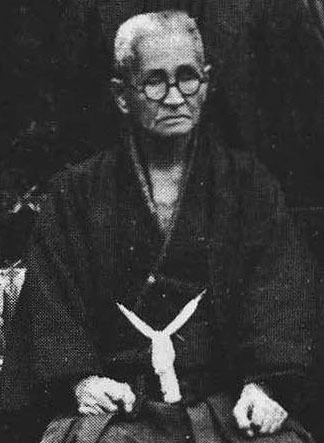 Kaneshi is in the photo posing in Kusanku posture. Kaneshi: I went to Shimabuku in 1947 or 48. Kinjo Chinsaku had already started in karate from Shimabuku. Kaneshiro: I started in April of 1950 when I was in high school (He was a high School Teacher). Zukeran is in the photo and is now close to seventy years old. Kaneshi: My younger brother Nagamine Yasuo is in the picture. Advincula: I show a photo taken in the Kamahara Theater of a demonstration Tatsuo had in 1960. 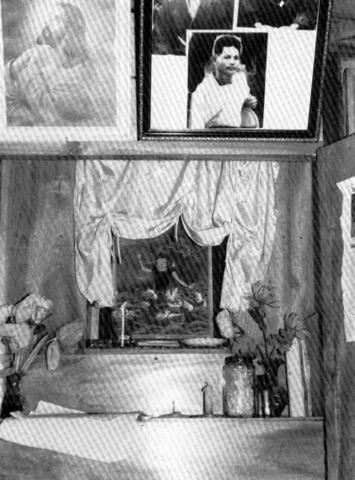 Kaneshi: Picture was taken in Showa 35 (1960) in the Kamahara Theater, Koza, City, Okinawa. Advincula pointing to the above photo at Steve Armstrong: "Does anyone remember (Steve) Armstrong?" Advincula: "When did Shimabuku Sensei name Isshin-ryu? Did Kaneshi-San give name?" Advincula Note: This question was asked because Uezu Angi said Kaneshi is the one who named Isshin-ryu, not Tatsuo. Uezu was wrong! Kaneshi states that his uncle who is a school principle in Shuri painted the original painting of the Megami. Kaneshi said he described Tatsuo's dream to his brother about dreaming about Ryuto (Dragon head Kannon and his brother painted the head of a fire breathing dragon on the body of a woman. When Kaneshi presented the painting on silk to Shimabuku, Tatsuo laughed and said it was wrong! It should be a Woman with the body of a dragon. Kaneshi had it fixed, but Tatsuo gave him the nickname, “Ryuto”, meaning “Dragon East.” It must be noted, Ryuto also Ryuzu means, Dragon head, which is the name of Kannon, the Buddhist goddess of mercy when she is depicted with or riding a dragon. It was Ryuto/Ryuzu Kannon that Shimabuku Tatsuo Sensei had in his daydream that influenced him to create Isshin-ryu, karate. Kaneshi stated that they made photos of Chotoku Kyan and Chojun Miyagi and gave them to Tatsuo to hang in the dojo. At the time, they could not find a picture of Motobu Choki. altar Kaneshi Sensei is talking about giving to Shimabuku Sensei. To break the ice they begin talking among themselves about Tatsuo and his training. Also about Kichiro who they do not like. They say Angi Uezu is OK, but that Shinsho Shimabuku, Tatsuo's second son is good. Kaneshi states that Tatsuo had a daydream and gave birth to the Megami. Kaneshi told his uncle Shosu Nagamine to paint Tatsuo'™s vision of the Goddess riding a dragon and explained what he wanted painted. Nagamine painted the head of a dragon spitting fire on the body of a woman. 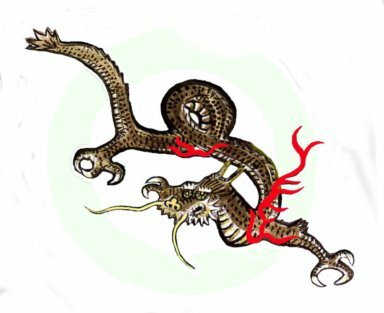 When Kaneshi presented the silk painting of the Dragon headed Goddess, Tatsuo told him he had it the opposite that it should be the head of a woman and the body of a dragon. So Kaneshi has his own picture of a Goddess with the head of a dragon which is the opposite of Tatsuo'™s Megami, where a Goddess, has the body of a dragon. Tatsuo gave Kaneshi the nickname 'Ryuto' or 'Dragon East' because of his idea. It was this time that Isshin-ryu was born and it was Shimabuku'™s idea. Advincula Note: It was this information "Ryuto" that led me to finding, the Azure dragon, or East Dragon. Azure dragon, or East dragon. Kaneshi states that Okinawa has about twenty different systems. The organization that he is in, Shoshin Nagamine is president and he is Rigi or director. They talked about styles and asked Tatsuo why he didn’t call his style Shimabuku-ryu instead of Isshin-ryu. Kaneshi states the bushi uses the most natural way and Shimabuku thought the natural way is to use a straight punch without a twist. So they all decided to use the vertical punch. But the original way as taught by Kyan was with a twist. So when Kaneshi and his followers left Isshin-ryu, they reverted back to the twist punch out of respect for Kyan Chotoku. The three of them discuss the fist and state that Tatsuo was always experimenting. They all show different ways to make a fist saying that the higher the thumb, the stronger the fist. They show a Goju-ryu fist and Shorin-ryu fist saying the Shorin-ryu fist is Ok but the Goju-ryu fist is bad. Today they use the Isshin-ryu fist with the thumb on top, but use a twist punch. They say that Tatsuo had already studied for thirty years before creating Isshin-ryu. They say that most of the karate kata are from Chotoku Kyan. Sanchin and seiunchin kata are from Chojun Miyagi. They discuss who they think are the five top karate men and name Matsumura Bushi, Miyagi Chojun and Kyan Chotoku. They all agree that these men will always be mentioned when talking about the top karate pioneers. Kaneshi talks about the Kenpo Gokui saying Miyagi Chojun brought it back from China. Kaneshiro: "Shimabuku was the Chan kucho or Chief (or Headman ) of a ward in Chan village [Tax collector]. Kaneshiro was a Junior High School teacher at the time." Kaneshiro'™s father was friends with Tatsuo and asked Tatsuo to teach his son karate. Shimabuku said it was better for Kaneshiro to practice school sports. Physical activity would bring Kaneshiro to higher levels such as running. Kaneshiro Kinu (brother of Kaneshiro Kenji) almost quit when Kaneshiro started in 1950. 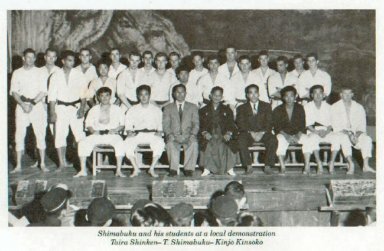 Kaneshi Eiko and Kinjo Chinsaku already had Shihan Certificates (Instructors Teaching Certificate'™s) when Kaneshiro started. Kaneshiro continues: "Tatsuo at the time was teaching old style Shorin-ryu. Tatsuo asked Chan-Mi-Gwa why he used a twist punch. Kyan answered that a rifle bullet came out twisted and generated more power so Kyan thought a twisted punch had more power. Kaneshiro further stated that's why Okinawan karate, even with a bo use a twist. They are looking for a one punch knockout. That’s why old time karate uses a twist punch." Kaneshi said Kinjo Chinsaku would never change even in front of Shimabuku, but the others did use the vertical punch and muscle block in front of Tatsuo to keep him from losing face. Shigema is A. J. Advincula (Sandan). 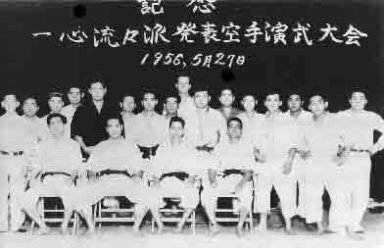 Angi Uezu is in the back row, second person from the right (Green belt). Not in the photo are John Bartusevics, Paul Heffernan and David Zazlow. Kaneshiro: "Shimabuku taught Kyan’s style before. So their style (that Kaneshi and them are now doing) is old style; Kadena Kyan’s. He lost all his top students. Who was left. Uezu Angi who were his son-in-law and Kichiro. But Kichiro did not know karate at that time, then before they know it he was a 10 Th. Dan (kaneshi, Shigema and Kaneshiro all laugh)." Kaneshiro continues: "There’s one more reason they all quit Isshin-ryu. One of the reasons is that Americans came and learned six months and he gave Shodan, Nidan and Sandan. Shimabuku said that they (Americans) were going home, so give them the rank, which none of them agreed on. Karate is heart and they could not agree on many things (Punch, block and rank given to Americans) so they all quit. It took five years for an exceptional student to get yondan in their dojo and fifteen to twenty years for godan and rokudan. You can'™t make Shodan in a year. It takes over a year to two years to make Shodan. That time was American boom, they don’t know karate seishin mind, spiritual, morality) yet they made black belts. Couldn’t agree on it. That's why he changed to Isshin-ryu, better for sports karate, (vertical punch) same as boxing punch. Close to more sports type." Advincula Note: In 1960, Harold Mitchum was promoted to 8 Dan, and Steve Armstrong was promoted to 7 Dan. Harold Mitchum started Isshin-ryu in March 1958, and Steve Armstrong in June 1959 at the Honbu dojo Agena, Okinawa. See photo taken in 1960. Kaneshi, Shigema and Kaneshiro did not know this about Mitchum and Armstrong, but they did know Shimabuku was promoting Americans to high ranks. We must remember, non of these Americans ever wore these ranks or announced them on Okinawa. We all knew we had to wait a number of years to wear them if we continued to train. While Harold Mitchum and Steve Armstrong can be seen wearing Red-and-white striped belts with Shimabuku Tatsuo, they never did at any event on Okinawa. had they, I am sure the Okinawans would have left earlier. Not knowing that Kaneshiro was stating that Tatsuo was copying boxing by using a vertical punch. kaneshi says the opposite. Advincula Note: About a month prior to Tatsuo’s death on May 30, 1975, I talked with Tatsuo. At the time he was having problems with Kichiro. Shimabuku told me he first wanted Kaneshi to succeed him but Kichiro got mad. So under pressure from Kichiro, Shimabuku apparently changed his mind and according to what Kaneshi said above, made Kichiro the head. I don’t think Kaneshi was aware that Tatsuo had told me in 1975, one month before his death, he wanted Kaneshi to take over when he retired from teaching. Kaneshi asked Shimabuku if he was to take over when Tatsuo stopped teaching but Shimabuku said Kichiro was to take over when he stopped teaching. Kaneshiro: “All the top (Okinawan) students went to the demonstrations. Each of his top students had their own students so they didn’t join Kichiro to Isshin-ryu. They were teaching the old style Shorin-ryu. Why change. They did not want to make changes. They did not want to tell their students the old way was wrong. Kaneshi’s group do not teach for money but to retain the old method of Kyan karate." Kaneshiro: “Chinkuchi - Shimabuku was unexcelled. I still don’t know how Shimabuku could obtain it.” Kaneshiro explains. “When feet closed in sanchin-last second, tighten and grip the ground. (Chinkuchi is) also (Kaneshiro demonstrates a punch) in the punch. (It) looks soft- last (explosive) power is chinkuchi (kime). ‘Chin’ is muscle. Soft and hard. In ‘ju’ (soft) you have power. In kendo same. In inhaling or spitting (Kenpo Gokui). ‘Chin’ (muscle) ‘ku’ (bone), ‘chi’ (power and control) is Hogen (Okinawan dialect). Kaneshiro: : Oreo (Sp?) and Auson (Sp?) were the first American students at Kyan Village. I remember them. At the time they were taught Shorin-ryu. The year was 1954 or 1955 when Americans were first taught. Cyrus Bess: Do you remember Nagle (Don), or Long (Harold)? Kaneshiro: "Yes, much later" (Meaning Nagle came after others he is about to mention below). "I don’t remember Long." Advincula Note : Writing names Orego, Orson as they sound to me. Latter, Shigema tells me Tatsuo wanted him to teach American's because he could speak English as he was working on the Marine Corps Base at Camp Tengan (Camp Courtney) as a cook. made the first picture of the Isshin-ryu Goddess and presented it to Tatsuo. Advincula Note: Given Buddhism's emphasis on nonviolence it may seem incongruous for a sword to be a key symbol In Buddhism. The sword in Buddhist art represents wisdom which has the capacity to cut through ignorance and delusion. 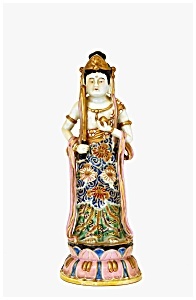 The Bodhisattva Manjusri, who embodies wisdom, is often depicted wielding a sword. 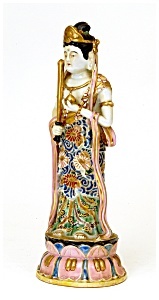 As shown above, the Buddhist Goddess of Mercy and compassion Kannonsama, or in Chinese Kaun yin, is often seen with a sword. This is what Kaneshi Eiko meant when he said, "Shimabuku made Sunsu kata with ken (sword) and (Megami) together." While our Isshin-ryu Megami has no sword in her hand, it is implied. The word "ken", also can mean fist. So one must practice karate and use great wisdom before using karate as a weapon. But we must also use our fists as a sword of wisdom to cut through ignorance and delusion of what Isshin-ryu karate isn't. Shigema and Kaneshiro both agree. Advincula: “Did Tatsuo ever sleep on a cistern water tank in the afternoon?" Advincula Note: Uezu Angi had first said Tatsuo had his dream of the deity Mizugami while he was sleeping on a cistern. It is now said, he was sleeping on a well. This prompted the question in 1984, did Tatsuo sleep at or on the cistern. They never heard that story. No reply from any of them. Advincula Note: Tatsuo called it for short Kamisama or Megami in front of me. Since it is a goddess of Isshin-ryu, Isshin-ryu No Megami would be the correct name, since it was the Goddess who influenced Shimabuku Tatsuo Sensei, in creating Isshin-ryu karate. Shigema and Kaneshiro mumble about Kikuyama Seshin and Steve Armstrong. Uechi Kazuhumi, the Okinawa Times Newspaper President and friend of Kaneshi allowed Shimabuku to set up a demo at the Times Hall. Chincho and Gain help set up the demo. This was the first time bogu was used in a Okinawa karate demonstration according to Kaneshi. Kaneshi: "This was the first time kendo gear was used. Shimabuku was first to use gear with sparring. Many did not agree with this type of sparring and including me and I questioned it. Naha and Shuri karate experts complained and disagreed with him on this type of sparring stating it was show karate. Later, many of them accepted this training method after it was proven and he took a leading part in perfecting this type of training. At the time they said it was only for show or only for demonstrations. We don’t do kata anymore. Before Shimabuku was center of demonstrations. Now Naha is center. If a dojo does not have demonstrations, they don’t have customers. Advincula Note on Kaneshiro’s last sentence above: The last sentence I believe means only about 10 people, the earliest to study from Shimabuku Tatsuo Sensei, Kaneshi Eiko, Shigema, genyu, Tome Yushin, Kinjo Chinsaku were the first to study. Advincula Note about Kaneshiro drinking with Harold Mitchum on his second tour of duty on Okinawa: While Kaneshiro had to wait thirty-two years for Kyoshi, Harold Mitchum along with Steve Armstrong were both promoted to very high ranks. Mitchum to Hachidan (8 Dan) and Armstrong to Nanadan (7 dan) in 1960. Kaneshiro did not know this. While Harold Mitchum was telling Kaneshiro while they were drinking together in Tairagawa that he would not accept Yondan (4 Dan), in 1960, he already was promoted as Hachidan (8 Dan) and posed for a photo wearing a Red and White belt with Shimabuku Tatsuo and Steve Armstrong. This was Harold Mitchum’s second tour of duty on Okinawa. I can see why many of the Okinawan thought there was a double standard in grading for Okinawans and Americans. In defense of Shimabuku Tatsuo Sensei, he did say we would only rate these grades if we continued our training over the years and would rate the grade after so many years. We also know, most did not honor his time in grade, and wore these grades as soon as they went back home to the states. Since I was always saying there was a double standard, Steve Armstrong in many of his articles and books, often said, there was no double standard. Take away ‘nu‘ from ‘Sun nu su’ and it is ‘Sunsu’ for short or ˜Father Sun' meaning 'Father of the head house'. Sunsu is Shimabuku’s grandfather’s kata (Dance name). Tatsuo got this nickname when he was town kucho. He was a tax collector so he got this name as a tax collector for Chan (township). Now while this may be confusing, most important is that Sunsu is a name of a dance, Shimabuku Tatsuo’s grandfather made. Kaneshi Eiko Sensei, was just expanding, on what the name means, in the Okinawan dialect. It does not mean “Strong man” as some Isshin-ryu partitioners claim. Often when asking Shimabuku Tatsuo about Sunsu kata meaning, he would reply, “Strong man”. One has to know, Shimabuku Tatsuo was limited in his English. According to Shimabuku Tatsuo’s second son Shinsho (Ciso), Tatsuo’s grand father was a very strong man. Advincula Note: Shimabuku had already made Sunsu kata before he had his vision of her in his dream. When Kaneshi said Sunsu was like the picture of the Isshin-ryu Megami, he meant the pose or raised fist kamae of the Isshin-ryu Megami, was influenced by his kata, Sunsu. the pose of the raised fist, in the Isshin-ryu Megami picture. Advincula Note: Chan is the township so it means Kana of Chan (village). Advincula: "When was the meeting when Tatsuo named Isshin-ryu or who named it?" Kaneshi: "Shimabuku asked his students about the name Isshin-ryu. Sensei decided to name it and everybody agreed to the name. I asked him, why Isshin-ryu? Sensei replied, “Because everything started from one.” Isshin starts from one heart." Kaneshi: "I was thirty-three years old. I started after World War two. I started from Nagamine Shoshin of Matsubayashi-ryu. He was teaching karate exercise taisho to the police and I was a policeman at the time. This was before I studied from Shimabuku. Three years later I move to Chubu (Central area at Kamahara (village)." Advincula Note: Kaneshi started from Tatsuo 1947 at Chan dojo. Kaneshiro: ”I used to visit with Kaneshi-san’s younger brother (Yasuo) who had started karate." 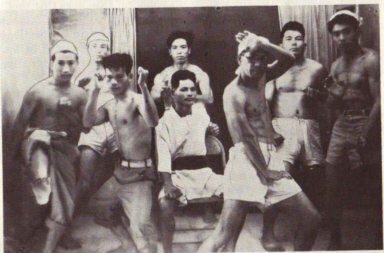 Kaneshi: "The picture (Group photo with Tatsuo and Kaneshi in kusanku pose) was taken in 1949. We were told by Sensei to pose in our favorite posture. Sunsu, Chinto. Maybe 1949 or 50 in Ginowan. Behind Taba. Yasuo taught me how to flip the sai. This is when I started karate." Advincula: "When were you born?" Kaneshi: "October 13,1914. I first started in Chan (village dojo). We practiced in the yard and inside. Shimabuku Sensei thought we would break the wooden floor so we moved outside. Shimabuku already had a concrete road in his yard which we worked out on." Advincula Note: After the interview, I went with Kaneshi, Kaneshiro and Shigema to pickup a newspaper article Shigema said he had at his home about the first demonstration Tatsuo never had. The article was to have shown the use of bogu gear. Shigema’s house was located at Uezu, Township in Gushikawa. Shigema couldn’t find the article. We then went to the Lobster House Restaurant in Tairagawa. We went to the second floor to a banquet room where several members of Kaneshi dojo had already arrived. There was a 5000 Yen charge per person to be placed into a kitty for expenses. Shigema paid for Michie and my dues. I latter found out that this party was called for my benefit only two days before. Earlier I had made arrangements for the interview. Besides members of Kaneshi’s dojo, Odo Seikichi of Okinawa Kenpo was invited. Odo was invited because he had one time studied karate from Tatsuo. During the dinner, Kaneshi, Shigema, Kaneshiro and Odo will tell stories about Tatsuo Shimabuku. Mr. Kaneshi started off by giving a speech and thanked all for coming, explaining that the party was called only a couple of days earlier for my benefit. So this party was for Bonenkai or a year-end (dinner) party and kangei kikai or welcome occasion. Kaneshi Sensei gave a speech on how we all had studied from the same teacher and that no matter what name we used (Shorin-ryu, Isshin-ryu or Okinawan Kenpo) that we were here to honor the memory of Shimabuku Tatsuo Sensei and that we were all Isshin-ryu. They were proud to honor me as their guest bringing back memories. Odo Seikichi Sensei then gave a speech on unity among the different karate and kobudo styles saying he has been to the United States eight times and on many occasions Isshin-ryu people have always welcomed him with open arms. He stated that Isshin-ryu is popular in the states and that he respects Isshin-ryu and deep in his heart he is Isshin-ryu. Kaneshi, Shigema and Kaneshiro continued to talk about training under Shimabuku Tatsuo Sensei. Kaneshi: Before they had a name they called it Chan -Mi -gwa-te after the nickname of Kyan Chotoku. Kyan Sensei was number one. Kaneshiro: "I came back from college in Japan and brought back a karate gi for Shimabuku Sensei. It was the first gi. Tatsuo Sensei liked the top but gave the bottom of the gi to one of the students." Advincula Note: This can be seen in the photo taken at the Tairagawa dojo in 1949. Kaneshiro and Kaneshi both tell me explaining the first verse of The Code of karate. ‘A persons heart must be the same as the universe’. You must not just have power, but a balance. "Karate is not for fighting but self defense. We must have humility and not brag. Keep ones head down shows you are smart. Head up, shows it is empty and a show off." Advincula Note: A story is often told in Okinawa that a full stalk of rice is bowed over lowest because of the weight of the grains of rice but a stalk without grains of rice stands tall because it has no grains of rice on its head. This it what Kaneshiro meant when he said, "Keep ones head down shows you are smart. Head up, shows it is empty and a show off." Kaneshi: "Some do kata and make noise hitting the floor (stomping), this is not right. You should be soft but with power." Shigema: "Karate is not used for fighting." At the Lobster House Restaurant was Nagamine Kojun. In a demonstration given by Shigema Sensei, attended by Kaneshi Sensei, in one of the demonstrations, Nagamine Kojun brought out a live chicken. He had it cradled in his arms with the chicken laying down head up facing forward. Nagamine was going to use a karate chop and behead the chicken. To calm it down he was petting it then from behind the neck tried to chop the chickens neck. Each time the chicken ducked avoiding the being beheaded. The attempt was made about several times with out success. Then some one made a sound like a chicken, the chicken curious looked up, Nagamine chopped, the head went flying. Shigema: "It took Nagamine experimenting and practiced on ten chickens before he could accomplish beheading a chicken." Soichi Nakahama talked about John Bartusevics, Paul Heffernan and David Zazlow.